I just swaped some values, linked the Decay rows and... used an "aereal" wire to jump the Attack, it looks ugly, but no prob, I'll use this one on my next build. This evening have to purchase some Retex RM 4 enclosures, will fit great in this pedal! And here's my new baby, hope you like it! Javi, where did you get that enclosure? It's awesome. The enclosure is a Retex RM4 (spanish brand). I purchased these boxes at Digital SA, a local store in Madrid. but I don't know if they sell international, you can drop 'em some lines or if you're interested (and don't know spanish :P) I can ask about. You can tag this, though I guess it was a stick really. As the hi/lo switch only uses lugs 1 & 2 of both poles I presume I'm ok to use a dpst switch? Awesome thanks matey. And yes you could use a single throw switch, I always tend to show doubles simply because I've found they are much cheaper and more readily available, so you may as well have the unused throw. I am also confused about the switch wiring. Did you ever figure it out? The switch pole labeling is inconsistent with the guide mentioned on the components page (http://mirosol.kapsi.fi/varasto/boxes_other/pots_switches.png). Which for me is a major crutch. If you remember that a changeover pole always has 3 contacts, then you should be able to interpret different numberings of the same thing. And Zombie11, it's a DPDT toggle switch so there is no 3rd unused pole. This isn't the stomp switch, it's a Hi/Lo toggle switch. The stomp is wired as per the Offboard page as is usually the case. 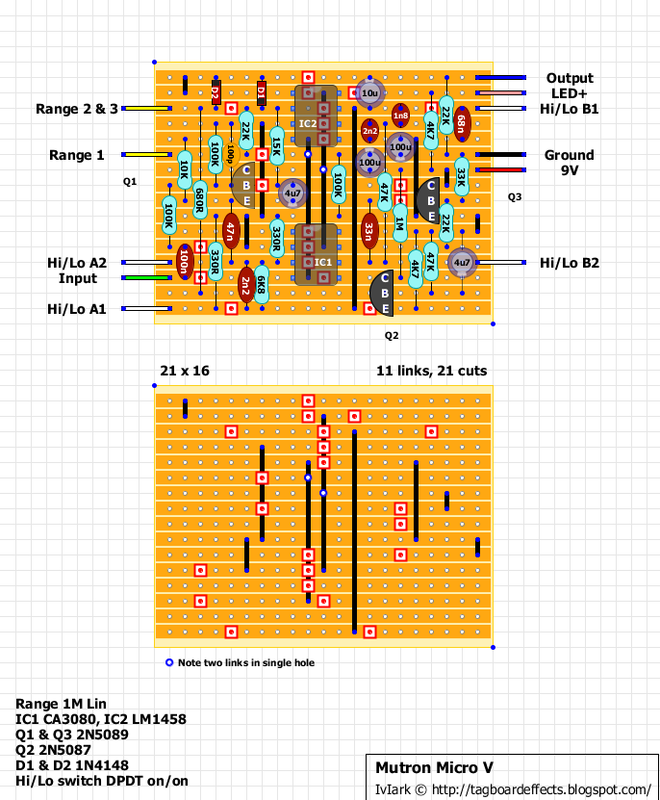 Can I use a NE5532P Dual Low-Noise Operational Amp (pedal parts plus) or a RC4558P op amp instead of the lm1458? If both, which would be best? Hi, I've just built this but get no sound when the pedal is turned on. I'm trying to eliminate the obvious things and the first one is that I've used 2N5088's instead of the 5089's and 5087. Would this make much difference? Or do they have a different pinout? 2N5087 is PNP, how you expect the circuit to work if using non compatible components?? I've put in a 2N3906 and 2x 2N3904's but all I get now is a constant electrical buzz. Will keep working on it to find where the problem/mistake is. Any help will be much appreciated. I would like to realize the micro MuTron v, but the problem is that I am lm13700. I can not find a diagram with this one. might get an update of the Shema with lm13700 please? thank you all for your help ..
ha ok! thank you very much for the link to ebay, it's true that it is not expensive. 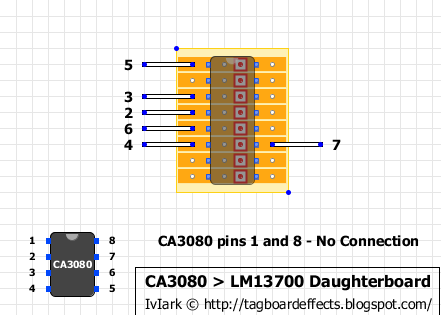 but, I would test the lm13700 with the adapter, but I do not understand the mechanics of this one .the 4 lm13700 connects where on the circuit? Well it won't blow up, but whether it sounds good or not is another matter. No harm trying though. 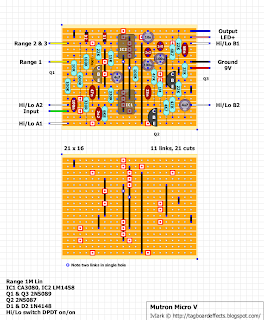 Hi there, is it possible to get a copy of the schematic you used for this one? I need to measure some voltages. Thanks! I went ahead and measured my voltages on ics and transistors, so if that helps at all i'll take anything I can get. I checked with the multimeter for grounding issues, power, and solder bridges so I don't know what else to check. Thanks!! To clarify, I only have bypassed sound, nothing coming out when engaged. I built this and it works for the most part except I get a steady clicking (or popping) sound when the effect is engaged. I've found through trouble shooting that the removing the pot gets rid of the sound and if the pot is all the way down it is also gone. I've also swapped out my ICs with the same value to rule them out as well. I'm relatively new to pedal building so any insight is appreciated. Thanks.